Hat – Next Hipster Trend is what's HAWT, NEXT! As hipsters well know, teh social mediaz are the dominant way to get messages out these days. Well, before the facebooks and the twitterverse and the google+ and instagrams and the tumblrs how did people feed their narcissistic needs? You got it, by Town Criering. Originally officers of the court, tasked with making legal announcements to the mostly illiterate townsfolk, the town crier was an essential part of daily life. Also called a “bellman” (do not make the mistake of EVER asking a crier to haul your bags to your room, nothing hurts more than getting clocked with a brass handbell.) Town criers strode up and down the streets of the town announcing all manner of news, advertisements, market days and such. In the German town of Goslar, the crier informed the citizens to refrain from using the local river as a bathroom on days when the brewery was collecting water for the local beer. Kinda makes your piddly job in analytics seem trivial now doesn’t it? Town criering is the ultimate in social media throwback, so retro that no one else on pintrest has even thought of it yet, perfect. Pursuing town criering NOW will give you a chance to draw several breaking hipster trends into one obscure and noticeable activity, you’ll love this. 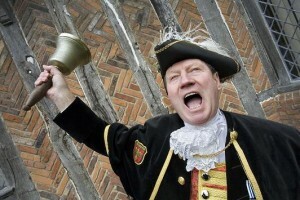 First and foremost, a good town crier needs a bell. Of course no ordinary bell will do, walking around tinkling some anemic peace chimes or yoga harmony jingles will only undermine the importance of what you’re criering. You need a solid bell of note and nothing says PAY ATTENTION like a Schulmerich. They claim to be “the world’s largest and oldest existing manufacturer of handbells in the United States.” This is a perfectly ironic and confusing, and all we know is that, swinging that bright brass monster in the crisp dawn light, you’ll be the envy of all your hand-bell choir hipster friends. Next, the always important attire. A Tricorne hat (which we are emphatically stating will be THE next hipster hat), knickers and possible Ben Franklin glasses, holy hell this is epic hipster gold in the making! Why didn’t we think of this before!? Once you’re all rigged up, the next thing is to get out there and do it! If you live in close proximity to other hipsters, we suggest the ol’ crack-o-dawn strategy. After a late night of drinking endless craft ciders and listening to high decibel circuit bent experimental electronica, nothing says “hi how are ya” like standing in the courtyard of the old button factory (now hipster condos) and stoutly ringing a huge hand bell reading hashtags from twitter and facebook. The classic town crier call starts with “OYEZ, OYEZ!” Then launch into a 37 minute regurgitation of everyone’s most self-obsessed postings from the night before. Use the most olde-englishy type accent you can muster. Remember, you have big shoes to fill, modern town criers hold the Guinness world records for the loudest humans, reaching 114 decibels so step it up! You’ll have lots of new admirers and after a week of doing this, maybe … just maybe they’ll all start to think twice before posting needless dribble. Ten or fifteen years ago, in near-paleolithic hipster times, you’d see trustfunders in blue-collar foam domes and polyester work shirts with names like “Gus” or “Clement” embroidered on them. A PBR in hand, the most working-class of all working-class beers. And all of it was ironic, because these dudes had never worked a day in their lives, if you don’t count practicing with their experimental dronewave band as work. The girls were no different, piling on ugly sweaters and homemade smocks, ironically peering through granny glasses at their knitting, shakily riding coaster bikes with huge baskets on the front, crafting, baking, and basically doing everything their home economics teachers taught them to do in seventh grade, except, like, not for real. Then something happened. Time passed. That money from the parents, which was never as much as one might have anticipated, ran low and fizzled out. Life happened. Those guys had to get jobs — pushing brooms, turning wrenches, carrying things, delivering things. Suddenly that ironic work shirt became pretty practical. On one’s own dime, saving money on cheap beer seemed like a good idea. Couples married. Children were born. Those girls who “like to knit” lost the quotation marks and became women who actually liked to knit. The granny glasses became actual bifocals. Crafting circles became a real social outlet. It still seemed a little punk rock to wipe that cake batter off of your sleeve tattoo, but the thrill of punk rock was nothing compared to the joy of baking a nice cake for your loved ones. Irony, in these ancient circles at least, disappeared, replaced by a new, more humble, earnestness. But that was then and this is now. That was them and this is you. You aren’t middle-aged. You sure as hell aren’t earnest. Swipe your ATM card: There’s plenty of money in your account. It’s time for a new hipster. A meta-hipster. It’s time for post-ironic irony. Now listen up, because this is complicated and you should definitely not attempt this if you have any doubts about your ironic “abilities.” Where they zigged, you zig harder. Where they zagged, you zag like your life depended on it. Where they said, “Hey! Look at me! I’m a traditional American!” You say, “Hey! Look at me! I’m a pre-post-ironic previous-generation hipster!” And then you wink like your eyeball is about to fall out. This is what makes it white hot: You’re going to have to step way outside your comfort zone. Seriously, you’re going to have to drink PBR. You’re going to have to dress like a buffoon, and not the good kind of buffoon but the lame kind of buffoon. You’re going to have to listen to Death Cab. It’s going to get ugly and dangerous. But if you pull this off, you’re a hipster stuntman. You can do this. We know you can. And if you can’t, well, it was nice knowing you. Micro-brews have been bhut jolokia-hot since the mid 80’s and show no sign of going anywhere but up on the hotness scale. 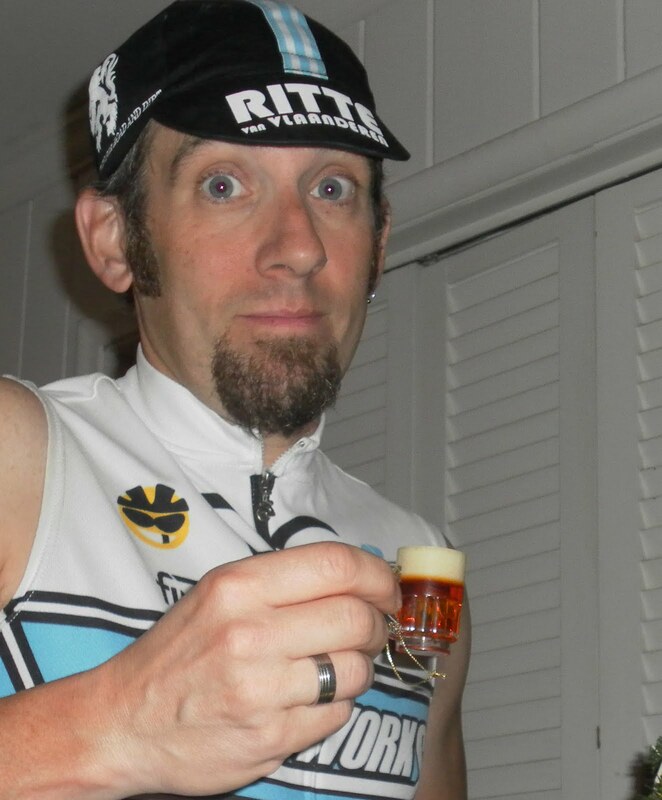 Talking about micro-brews, of course, is even hotter. Presently you get to impress your friends with knowledge of hop varieties, yeast strains, grain bills, roasting, malting, milling, the lovibond scale, specific-gravity, attenuation rates, flocculation, the IBU scale, head retention, mouthfeel, dry-hopping, etc. etc. etc. Of course you got a 100% on your indie band or craft-beer quiz. The problem here is that all hipsters are into micro-brews and every self respecting hipster is a homebrewer that has at least three 5-gallon batches (including a coffee stout) under their belt. So how the heck can you impress anybody on the subject anymore? I mean you could go all out and make an amazing brewkettle out of a reclaimed keg, or an electric HERMs system, but let’s face it, Kevin is probably already slaving away on a project like that in his garage with a borrowed angle grinder. When you can’t go bigger on a supertrend like micro-brews and homebrewing you have to go the other direction … smaller. This is a solid opportunity to multi-trend because, as we’ve outlined, tiny food is stupid-hot right now. Truth be told, on the surface there’s not really much to this one … you just brew a really small batch of beer. Of course how you brew it and more importantly who notices you brewing it are the most important details. You could probably go as big as a couple of liters, but to really impress you should brew only a single pint. 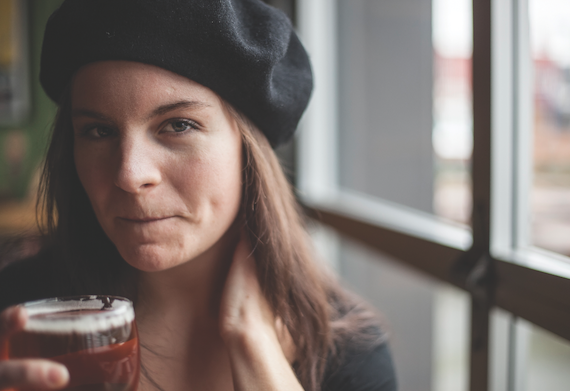 Either play it safe and cask condition the only universally accepted hipster style of beer, an IPA, or go bolder with a Russian imperial stout. Many hipsters will love this because “Russian,” “imperial,” and “stout” are three of the top ten hipster words to use right now, rounding out the list are “paleo,” “crossfit,” “organic,” “artisan,” “heirloom,” “croudsource,” and “bodymod.” … but I digress. On to the brewing. Make sure it’s a busy day in the neighborhood and invite a friend over to be your “assistant to the brewmaster” (use that exact title.) If you’re feeling confident don some lederhosen, but at the very least you should accessorize with a traditional Bavarian alpine hat, it has a short brim and we all understand the importance of that. Setup your brewstand somewhere in the middle of your driveway and make sure that no trees or shrubs block the view from the intrigued onlookers. We’re going to keep it simple today with a partial mash extract batch. Don’t use your usual 6.5 gallon stainless steel brewkettle, use the smallest pot in your apartment. (Of course you live in an apartment, mortgages are for slaves.) Your brewstand should be nothing much more than a coleman camp grill. Steep your specialty grains in an actual tea bag. With this small of a batch it would be easy to overdo the 40L caramel malt. Once you’ve steeped at 162F for at least 40 minutes, bring the now wort up to 212F for your liquid malt extract and bittering hop addition. As with the specialty grain, you need to go light on the hops. Two individual cascade hops should be good here. Boil for 45 minutes, stirring occasionally with your no doubt self-whittled hickory mash paddle. Turn the heat up to encourage a few hot breaks to coagulate proteins. Next, add your flavoring hop and wait another 10 minutes. Finally, add your aroma hop and rest. Extra points if you build a tiny immersion wort chiller to get the wort down to 70F quickly, but you can just add some cold water and probably will go this route because most of your wort from this pico-brew has boiled off. Pitch some obscure yeast strain that nobody has heard of. After brew day let it ferment for about three weeks and plan a tiny food party. If you took our advice and already did that (kudos) fear not; just send a pigeon to Ike, Theo, and Matilda inviting them to your house for a sampling. When they arrive have the pint/secondary fermentation vessel in the center of your reclaimed wood coffee table along with four shot glasses. Before you uncork (never cap) your pico-brew explain the benefits of smaller batch sizes and educate them on the metric prefix scale and be sure that they know pico denotes 0.000000000001 the size of the typical macrobrew batch. Speaking of that, it’s nowhere near ready to drink, but you could use this event as an opportunity to show off your macrobrew cellar. Pour each guest a 3oz serving and allow it to breathe. Note the head retention. As you bring your masterpiece to you lips inhale sharply through your nose. Swish it around a bit like a seasoned taster and comment on the fruity esters from the Belgian yeast strain and the noble hop profile. Look around at your guests, satisfied, and remark “for me, anything more than a 3oz serving cuts into the appreciation of the craft.” They will eagerly nod in agreement and probably say something using the phrase “right-size” and the word “mouthfeel,” even if they don’t know why. Everybody gets invites to lunch from friends. Cafes and restaurants of all sort are packed with full tables of 4-8 hipster buddies, writing hakius (only if it’s April), discussing Carl Jung, and mocking western medicine. So how does the hipest of the hipster culture react? Eating alone of course! 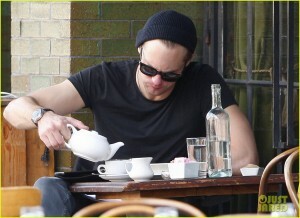 For one thing, when friends ask you out to lunch you can say that you can’t because you really need some time to think. This will make them think that you’re really deep and focused, and even willing to sacrifice fun times with others so you can meditate on whatever world crisis is obscure right now. How about tribes clashing in Darfur over gum arabic production? When you get to the restaurant and the hostess asks you how many you can proudly proclaim “just me.” Because that’s who’s on top of the hottest trend right now, just you baby, just you.